Outfit: Comptoir des Cotonniers dress, Rick Owens leather jacket, Hermes Collier de Chien and Christian Louboutin pumps. Oh. Em. GEEEEE. Marlene, the tomboy is wearing a dress. And heels. Let it be known that this will NOT be a common occurrence nor should you expect to see such ladylike attire on my body in the near future. This is what happens when you're faced with torrential and continuous downpour as well as severe flooding. Basically, it means that I'm stuck at home with Lil L and her buddy and partner in crime. So I put them to work (actually, it was that or I start climbing the walls) as my photographer and assistant. 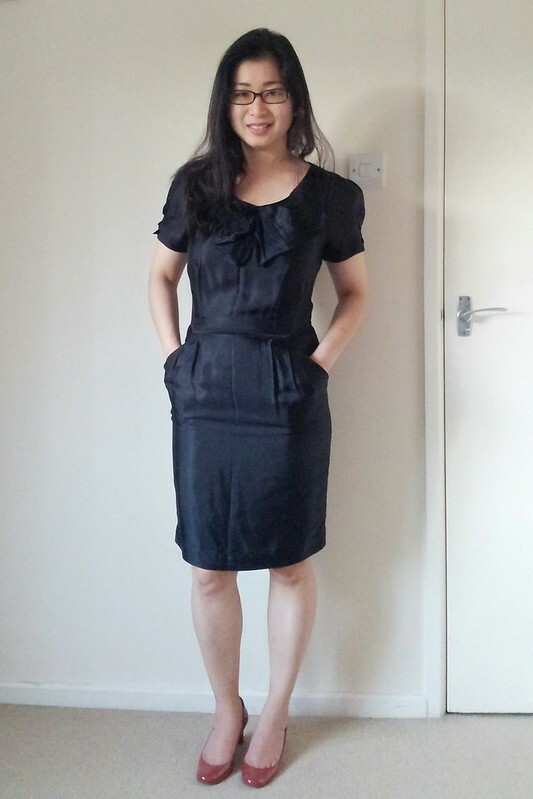 I nabbed this black Comptoir des Cotonniers dress years ago for £40. Cost per wear? £40. Notice those semi permanent crease? That's because the dress has never seen daylight (and I'll do ANYTHING to avoid ironing). EVER. I kept it because the clever construction gives me a waistline and hides my protruding tummy. Ever tried sucking your tummy in for a couple of hours when you're wearing a bodycon dress? Yeaaahh.....I don't recommend it. The thing is, the dress is too feminine for my taste. I've been thinking of a way of reviving it to suit my personal style. I figured a bada$$ leather jacket and Hermes dog collar (sorry, couldn't resist. The French made the words Collier de Chien sound more sophisticated than it actually is) will make it a little more edgy. I'm still hunting for a pair of mid heel caged sandals to complete the look. p.s. LOVE blurry smartphone photos. The best (and free) anti aging solution on the market. Oh, the kids said I had to credit the photos back to them. Sheesh. Photo credit: Lil L (photographer) and Lil C (assistant & smile critic). I LOVE it! Comptoir des Cottonieres is a fabulous label, and I love their dresses. I find them tomboy, gamine, rather than feminine . . . which goes to show you we each have a perspective from which we swing. You look fabulous! OMG. Girl, start wearing dresses. Now. Starting yesterday. You look incredible!! Slender (what on earth are you talking about when you say you have "batwing arms"? ), shapely, feminine and beautiful! You have a FIGURE! And a good one at that! Flaunt it. Yup, totally agree with you about needing edgy shoes. Been thinking about a pair of heeled booties or lace up heels. I'm REALLY lacking in that department. What?! I can't go flash too much of my thighs. What happens when I bend down to pick something up? M, I think the dress looks good on you and I like it paired with leather jacket and the CDC. Perhaps you might also want to consider tights and your ZARA biker boots for the colder weather now, and the Trina or your Chloe/Marni low-heel sandals for the warmer weather. I did not know you were a murderer at heart! Well when I saw you wearing a ...dress I choked my cappucino and had coughing fight for 5 long minutes... Would you like us to die in front of your ugliness, I thought better than you!! All right save the sarcasm, it is true you look uncomfortable and unsure of yourself but well you also lookk good because you are not hiding as much as you use to do. You still can be a tomboy (but are you sure you are a real tomboy, ask yourself, I was once before a discovered my body and forgot to feel self conscient in a negative way; still not a girly girl with frilly things thanks God!) but wear dress or skirts. Being a tomboy is more acting like one than refuse to wear "feminine" outfit. True, in this picture you added difficulties to yourself: fitted dress AND heels (Louboutin for God sake!) but obviously you can wear them and look very good. No we are not afraid at all seeing you, but are you? Maybe this dress is not the best one for your taste or body shape but if you were willing to try on some other style you may find one that can suit you. Still that dress is quite nice. Why, as wrote another commenter above, won't you wear it with tights and boots (as everybody now is wearing boots with everything, soon with gowns and babies with onesies...) or flat shoes (like derbies or loafers or "elegant" ahem sneakers, please not those horror from I Marant, my opinion, or even Converse, black). And your leather jacket is very nice but do not let it overwhelm you, you have nothing to hide (as a fellow petite, I can understand some of the issues).And you can also add some nice scarf, long or short in a casual knot or chunky jewel. But indeed you look great in this dress, I mean with A dress, nothing to feel ashamed of. I think you need to wear dresses more often! I reckon you put this on with a denim jacket and trainers and off you skip! A dress with a waistline! Are you okay Marlene? Just joking - you look lovely and it's a fab dress because it has .... pockets! to indulge your inner tomboy. You look so sweet! But strange somehow. Wear more dresses and you will get used to it. Pretend you are an OL? I once pulled a "Ling Woo" to a friend, minus the rich part: " I only go into work to wear my outfits!" - Ally Mcbeal. It feels so weird to see you wearing a dress! I think it's the first time? Anyway you should do it more, you look amazing! So sweet of you to say so, Anne but I felt weird wearing a dress. I just realized I desperately need some statement boots/shoes. More gamine is definitely hitting the nail on the head. I had another look at the photos and the Loubies just looked out of place.